Yaay! The lap blanket knit from Marble is finished. Well, mostly. I do have to finish off the ends and block the thing. But all of the knitting is complete, and I grafted the edging’s last four stitches to its beginning, so that the seam is unnoticeable. Aileen in Springfield asked me how I was filling in the half-motifs, because she’s working on a modular square piece, and prefers the look of the units tipped to present as diamonds. I’ll attempt to explain, but I won’t be publishing this as a full up pattern because of general lack of interest. My treatment includes a nifty self I-Cord edging, worked as the piece progresses. It’s a nice, robust “hem” that stands up to wear and tear nicely. Here’s how. I started on the REVERSE of the piece, so that any ridges formed by knitting the edging on would happen on the front, the same side as the native diagonal and vertical lines of the modular squares. I needn’t have bothered with this refinement, because as you can see in the photo above, the join lines are quite indistinct. Also note the slight ruffling of the edge triangles. That should steam-block out (mostly). Starting at Point A – the rightmost corner point of the motif at the bottom right of the blanket. Row 1: Cast on three stitches, then pick up one in the rightmost corner of the first motif. Row 2: Slide all stitches to the right end of the needle, I-Cord style. Knit 4, and pick up one stitch in the next available selvedge stitch of the diamond motif. There should be 5 stitches on the needle. Row 3: Flip the work over so you are working away from the main blanket. Slip the first stitch purlwise. Knit the second stitch. Slip the final three stitches one at a time, all purlwise. Row 4: Flip the work over so you are working in from the edge, toward the main blanket. Knit the first three stitches VERY FIRMLY, pulling the yarn tight in classic I-Cord style. Knit the remaining stitches on the needle. 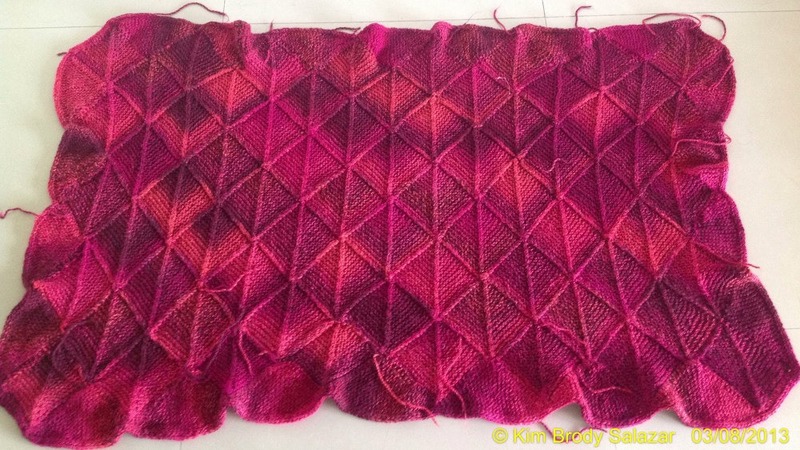 Then pick up another stitch in the next available selvedge stitch of the diamond motif. There should be 6 stitches on the needle. Row 5: Flip the work over again so you are working away from the main blanket. Slip the first stitch purlwise. Knit the second and third stitch. Slip the final three stitches one at a time, all purlwise. Row 1: Starting at the edge, working towards the main blanket. Knit the first three stitches very firmly, I-Cord style. Continue knitting across the row until only three stitches remain. Knit those three stitches together. Pick up one stitch in the first available selvedge stitch on the next motif. Row 2: Working from the main body of the blanket back out to the edge. Slip the first stitch purlwise, knit until three stitches remain. Slip these three stitches one at a time, all purlwise. Continue working Rows 1 and 2 of the decrease progression until you are back at the tip of Motif #2. At that point you should be down to four stitches. In the event that you have five when you reach the motif tip (which happened to me a couple of times, and I didn’t take the time to figure out why), on the last iteration of Row 2, just knit the first two stitches together instead of slipping. Fudging this way is invisible – the goal is to make sure that by the time you start down the increase section of the next motif, you begin at the point with only four stitches on the needle. Now. How to use this same edge I-Cord idea on a straight edge? You can do it one of two ways, depending on whether you are working this at the same time as the main body, or adding it as a supplemental feature on a finished edge. 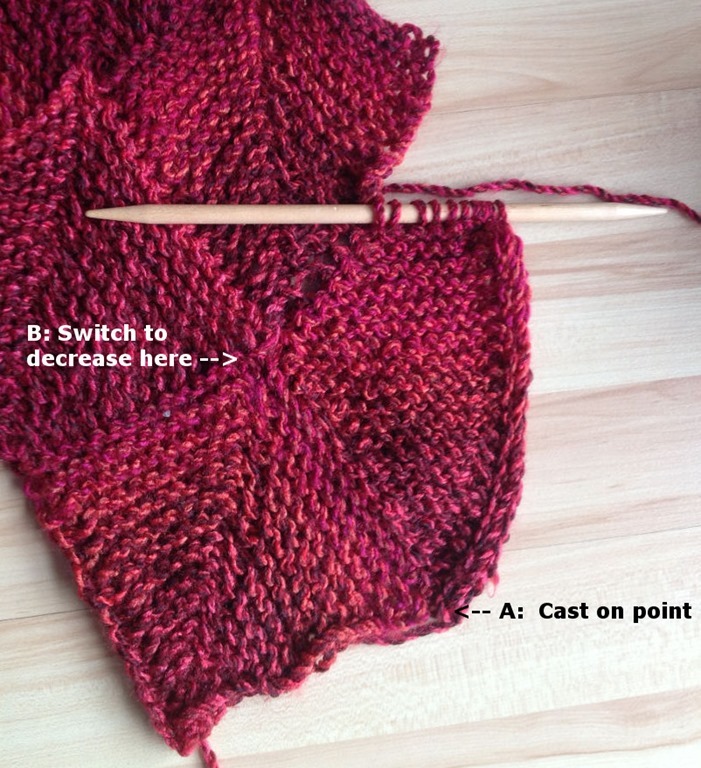 First, if you’re working a flat piece in garter stitch or stockinette and you want to add this at the same time as you are working the main body, just set aside the first three or four stitches at either end for the I-Cord curl. Or if you like, add some stitches for the treatment to your total count, but be aware that this will use more yarn and if you are working from a set pattern with a set amount, adding even six total to each row (3 left and 3 right) you will risk running out of yarn. Once you have figured out how many to set aside or add, work each row as you usually do, BUT at the end of every row, slip your I-Cord designated stitches, and at the beginning of each row, KNIT them. You’ll notice that this edging is the same front and back, so if you are trimming both sides of your scarf or blanket, the left and right edges of your piece will look the same. This is pretty much the same thing I described as being useful for making straps for bags back in 2004, but with a whole blanket in between the I-Cord edges rather than just a couple of stitches. If you want to add this I-Cord edge to a finished piece, it will be easier if you have worked a slip-stitch selvedge, so that the edge loops are crisply defined. But with fiddling this will also work on non-slip-stitch edges, and on cast on or bind off rows. Cast your desired number of stitches onto your needle, pick up one stitch in the body of the work to be trimmed. Flip the work over and heading back out from the body, knit the first two stitches together, then slip the rest purlwise, one at a time. Now working back from the edge towards the main body, knit the designated I-Cord stitches firmly, knit the attachment stitch, and then pick up another stitch in the main body. Continue in this manner, adding one stitch every “inwards” row, and knitting it together with the attachment stitch on the “outwards” rows. This is slightly different than the method I’ve described before for adding I-Cord to an edge, because it moves the attachment point one stitch away from the I-Cord itself, and makes a neater presentation with both sides looking more like each other. It’s lovely and the border looks great. I hope you will show it to us after it’s blocked. Just wanted to let you know that I finished the Lattice Wingspan…(it’s soaking as I type) and will post it on Ravelry when it’s blocked. I used the Mini Mochi in Reds and it’s subtle but gorgeous. Not sure how I’ll actually wear it! As with others, I ran out of yarn after 8 triangles, but had several shades of the Jamison Jumper yarn and used three hues from orange to deep red, one garter bumpy edge each and it worked perfectly! Clever! Happy to help. -k.